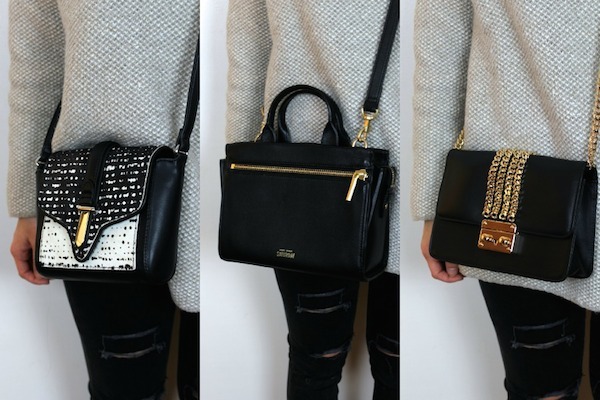 Mini bags are the perfect option for the on-the-go girl. They're chic, simple, and easy to take from day to night. I've always used oversized totes as safety nets for any "just in case" moments, though in reality, most of those moments never happen. If I'm just running out to grab lunch with a friend, a mini bag filled with my wallet, keys, and phone is really all I need. Plus, who can resist anything in miniature size? It's no wonder that Laduree macarons are the Instagram pic of choice. This is my go-to bag for almost any situation. It has a simple design that complements almost any outfit and just enough room to carry some extra necessities. I recently added this gem to my collection, and I just love the chic statement it makes. While the added texture is bolder than my usual bag choices, the neutral color palette still makes for easy outfit styling. The gold hardware of this bag makes it perfect for the day-to-night transition. This bag has just enough room for my three essentials, making it a great choice for those late nights out. What are your opinions on the mini bag? Feel free to let me know in the comments below! yay for mini bags!! i own a number of them in my closet too.. and they're perfect for days when i don't even wanna bother bringing my entire house with me to the mall or to brunch with the girls. hahaha! I love all of these bags. The Kate Spade one is my favorite. Great post! It's my go-to bag for almost anything! Thanks! These bags look very nice!!! So cute!! They are so pretty! I love the zara bag! I love mini bags, they're all I carry. The Zara one looks more expensive, it looks like it's from a high-end brand. You've got a good eye, girl. I think you just revived my love for mini bags! I remember when I wouldn't buy anything but these, and you might've just put me on that path again. I absolutely love all of these and how you've styled them in the past! My favorite is definitely the Kate Spade! So classic yet it stands out! I love your collection! That Zara bag is so beautiful. I completely agree that a small bag is sometimes the only way to go - hassle-free.